Eurotrash can often be enjoyable with or without plot, with lots of gore or none, and with many well-rounded characters or sappy disposables. They have a sort of charisma that hides the blemishes within a terrible film. Knowing this, one might question whether what they just saw was good, or simply a bad movie blocked by mirages of entertaining scenes. Anthropophagus seems to have a plot, it doesn’t hold back on the sickening grue, and the characters are distinguishable enough to create a positive interaction with each other. The setting appears to be a deserted Greek island, one in which no one can escape. It looks like Joe D’Amato has planned out an excellent adventure. A couple (Simone Baker and Mark Logan) go to the beach to relax and swim, where an unknown being lurks in the waters. The crazed lunatic hacks his way through the couple, burying a meat cleaver into each. Meanwhile, tourist Julie (Tisa Farrow of Zombi 2) overhears a group of other tourists talking about their boat, and she asks if she can tag along. Allowing Julie to join them, the group takes their boat out towards a mystery island where Julie has been before, visiting friends. However, once they arrive, nobody is around. The last contact log is dated over a month ago, and there is a dead body found in an old home. Things start to get scary when the boat that took them there is carried off shore. Is there some reasonable explanation for all of this? Staying at Julie’s friend’s place, they find a scared Rita (Margaret Mazzantini), shivering, spouting claims that she could smell him. But who is him? Terra card reader Carol (Zora Kerova of Cannibal Ferox) is angry with Julie, accusing her of being the reason for their misfortune. She runs off, leaving everybody worried. The grotesque killer then makes his entrance, and it is revealed that he is a cannibalistic maniac, who murdered everyone on the island. And he’s about to increase his body count. As the tourists drop like flies, Julie must find a way to get her and her friend, Rita, off the island, before things get really nasty. Heads will be severed, fetus’ will be eaten, and a disturbing family secret will be unleashed. 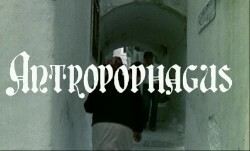 Notorious as a video nasty, banned in many countries, Anthropophagus has a lot to live up to. Sadly, even in its uncut state, there’s not much to go psycho over. It’s a gory movie with some pretty disturbing ideas, but in no way is this one of the most disgusting films of all time. It is, however, a beautifully set and eerie piece. We take a look at Athens in Greece, then make our way to the spooky, yet loveable, abandoned island. The music is, in few places, somewhat of a cousin to such scores you may have heard in Zombi 2, except, more disturbing. In fact, a lot of this flick feels like a Lucio Fulci production in general. It’s only when you pay close attention does the camera work seem the approach of a different director. Tisa Farrow plays her role, in my opinion, better than in Zombi 2. She’s in her late twenties, sporting a laid back white and blue shirt, and some regular blue jeans. You feel for her life more, because she’s running scared from an evil beast, reaching so very close to her demise in many life threatening experiences. One of the most suspenseful scenes is where Tisa’s character finds herself hanging from a rope in a well, with the cannibal killer crawling up the well’s ladder. You know that the monster will show no mercy. After all, he devoured a fetus just moments earlier. The most disturbing scene is where Julie walks into a secret room, and multiple bodies are just laying around, but they are all covered in white sheets. Sometimes, the less that’s spelled out for you is the most effective. Anthropophagus was actually followed by a sequel called Absurd, which is said to be a bit tough to find. This feature is much less a cannibal film than it is a slasher. Using knives, hands, and his trusty cleaver, the beast adds a lot of flavor to his meals. He’s so vicious and cruel, it’s hard to think of him as even remotely human. 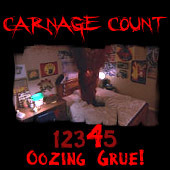 Released on a two disc special edition DVD by Shriek Show, it’s little more than an entertaining dip into the stalk and slash genre. I believe multiple viewings will not be hard to sit through. There are some slow scenes, but many uneventful parts can be saved by the cinematography and deliciously dreadful tone. Don’t let the Grim Reaper get you. Get him instead. Buy it!